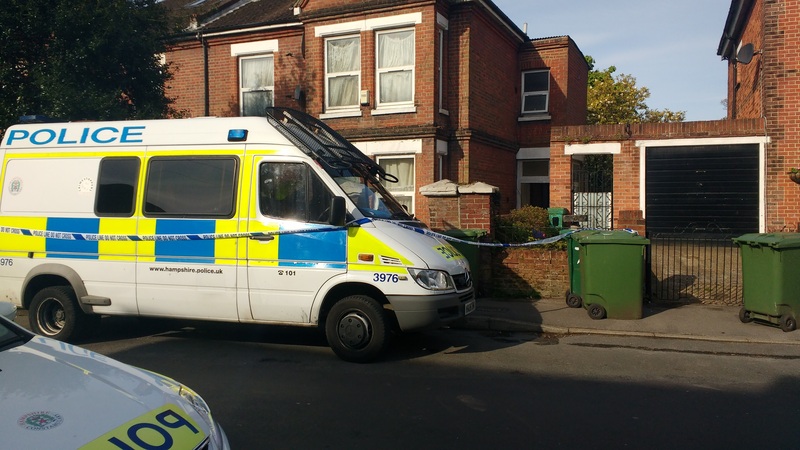 Hampshire Constabulary have launched a murder investigation after a body was found at a property on Westridge Road on 29th April. The body of an adult male was this afternoon, and police were on the scene at 4:15pm. Two men aged 26 and 35 are in police custody and believed to be assisting police with the investigation. They are both from Southampton. Residents have reported that Westridge road has been sealed of by the police and is closed at the junction of Belmont Road, near St. Denys station. Some residents have stated they weren’t allowed home in the evening or they weren’t allowed to leave their homes due to police quarantining the area. Police are stopping people from crossing the cordon, with the exception of residents. A post-mortem is being carried out, and identification procedures are continuing. Everyone living in the house have been evacuated while forensic officers comb the building. Forensics experts and scenes of crime investigators dressed in overalls were spotted going in and out of a house on Westridge Road today (30th April). Some local residents are claiming it is related to an incident involving a dog of people living in the house, but the police have not confirmed this. The house was worth £400,000 and believed to home to three men and one woman, all who had self-contained rooms. We are in the early stages of an investigation into a man’s death which is being treated as suspicious. We understand there may have been a dispute at the address in Westridge Road earlier today. I am appealing for anyone who may have witnessed or heard this dispute to contact us. We are also keen to speak to anyone who may be able to provide us with any information which could help us establish the circumstances of the man’s death. The body was found in a multi-occupancy property and today our forensic officers are carrying out extensive searches there. To allow this to happen we have moved all the residents from the property and put them up in temporary accommodation. We are also anticipating that the scene will be cordoned off for some time yet, so we would like to thank residents for their patience as we continue our investigations. We understand that there may have been a dispute at the address earlier yesterday and we are appealing for anyone who may have seen or heard anything to contact us if you haven’t already as you may have information which can assist our investigation. Reassurance patrols are to be carried out by the police over the weekend, and it is believed to be an isolated incident. The road is expected to be cordoned off for the foreseeable future. The area has a heavy population of students, and last year was named one of Britain’s top 50 ‘crime hotspots’ where more than one crime a day was reported. It’s pretty surprising and shocking to see so many police here. This is a pretty standard area with lots of students living here. There were around five police cars an ambulance and loads of bigger police vans. When they shut the road I realised it was something serious happening. It makes you feel bad. I’ve never heard anything like this happening here as it is normally a very quiet area. Anyone with information regarding the crime is asked to call 101 quoting ‘operation windless’. Westridge Road: Westridge Road is currently closed at the junction of Belmont Road due to an incident. It's all going down on Westridge road. Road taped off in both directions. Load of police. Wessex Scene will keep you updated as this story develops.